This post contains major spoilers involving both The Small House at Allington and The Last Chronicle of Barset. Literature is filed with love affairs that do not work out. There are plenty of rejected suitors, unrequited loves, as well as sadness and tragedy. So why focus on one unrequited love affair that spans the last two books of Anthony Trollope’s The Chronicles of Barsetshire? There are several reasons. One reason is that this pair is so interesting, is the fact that of all the romances that seemed “meant to be” in this series, this is the only one ends unsuccessfully. The relationship between John and Lily is complex, full of nuance and false directions. The two grew up as childhood friends. John fell in love with Lily as they both matured. Lily was aware of John’s affection, but only saw him as friend. Enter Adolphus Crosbie, a complex but ultimately untrustworthy and a scheming man who sweeps Lily off of her feet. The two becomes engaged. Shortly thereafter however, Crosbie breaks off the engagement when he sees a better opportunity in a union with the wealthy and connected Lady Alexandrina De Courcy. As a result of the broken engagement, Lilly is plunged into a depression that lasts for years. Though John proposes to her multiple times she cannot bring herself to see him as anything other then a friend. She is also still in love with Crosbie. Over the course of the two books John’s chances seem to improve. He matures and is seen by all as more successful and confident. Then years after being jilted, Lily encounters a now widowed Crosbie, who attempts to resume the relationship with her. Ironically this encounter seems a tonic to Lily, as the new impression of Crosbie is that he is not the man she imagined him. Though she falls out of love with Crosbie, Lily still seems damaged. She seems to want to bring herself to accept John’s proposal, but cannot quite bring herself to take the plunge. She rejects him during what he declares is his final attempt. However she pledges to never marry anyone else and to die an old maid. Likewise there are strong hints that John will also never marry anyone else. Because the union of Johnny Eames and Lily Dale never comes to be, it is unique relationship in The Chronicles of Barsetshire. The two are the only couple in the series, that though they seem destined to marry, never actually do. The fact that every other prospective pair portrayed in the books overcame adversity and entered into relatively happy marriages, seems to give the failure of this match, some extra gravitas. Indeed, since the pathetic end of this aborted union was so different, the reader is left a bit surprised and emotionally disappointed. I stress emotionally disappointed because I would argue that the pathos created by this resolution is aesthetically satisfying and strong. What are we to make of the life choices of our protagonists? As is typical of Trollope’s creations, the thoughts, feelings and motivations of the each is complex, and answers are not simple. I think that there are two distinct things going on with Lily. First, try as she seems to love John, she can only really view him as friend and not as a romantic interest. Such feelings and attractions in people are inscrutable and one is tempted to simply say that such things are what they are, and leave it at that. But there is more going on here. Lily’s psyche has been irreparably injured by her broken engagement with Crosbie. He has hurt her in a profound way. Even after she gets over her love for him she is unable to form a romantic attachment with anyone else. It is suggested that had Crosbie never come along, she might have eventually developed different feelings for John. But the damage has been done. The above seems to be conclusive evidence that the odd lifetime rut that Lily, and possibly John, fall into, is not meant to be seen as normal human response, even in the 19th century. This is Trollope and he is always complex. Lilly is far from a shallow person. She is intelligent, lively, and kind. As the above also indicates, Lilly Dale is admired by many readers. Another aspect that seems very different concerning the relationship between this pair is very ironic. Most of the other couples who struggled to end up together met opposition from friends and/or relatives. This was true of Major Grantly and Grace Crawley as well as Mary Thorne and Frank Gresham to name a few. Those couples overcame this resistance. In contrast, virtually all of John and Lilly’s friends and relatives are pulling for the two to get married. Many aid John in his endeavors to woo Lily. Some bring pressure upon Lilly. The irony here is interesting in that the couples who encountered obstruction ended up marrying and the one couple who was encouraged to marry by everyone does not end up together. I find Trollope to be a mostly optimistic writer. Oddly enough the sad resolution to the relationship between Lilly and John gives more weight to his optimism in my eyes. Someone who recognizes that not everything turns out all right in the end, but who nevertheless views the world from an optimistic point of view, seems to be on stronger footing. It shows that the thinker is not just living in a Pollyannaish and unrealistic world, but instead has derived their opinion from a credible look at reality. The relationship between Lilly and John is one of many ways that Trollope looks at the complexity of the human condition. As this is one relationship that the author has fashioned a little differently, I decided that a slightly closer look was warranted . It is one of many reasons why I love The Chronicles of Barsetshire. My commentary on the first book in the Chronicles of Barsetshire series, The Warden is here. My commentary on the second book in the Chronicles of Barsetshire series, Barchester Towers is here. My commentary on the third book in the Chronicles of Barsetshire series, Doctor Thorne is here. My commentary on the fourth book in the Chronicles of Barsetshire series, Framley Parsonage is here and as it relates to gender roles here. 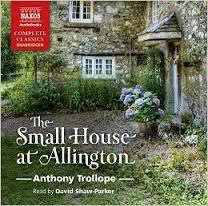 My commentary on the fifth book in the Chronicles of Barsetshire series The Small House at Allington is here. My commentary on the sixth book in the Chronicles of Barsetshire The Last Chronicle of Barset is here. My commentary on Trollop’s unusual Point of View is here. 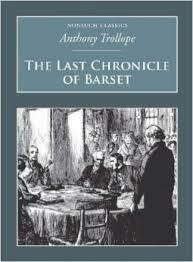 Anthony Trollope’s The Last Chronicle of Barset is the sixth and final book in the The Chronicles of Barsetshire series. 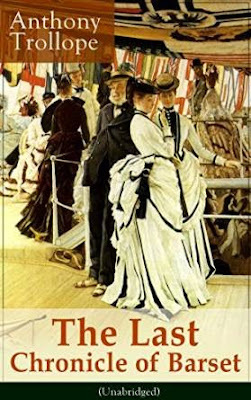 Within the novel’s 928 pages, Trollope fits both an independent story and a comprehensive wrap up of what has gone on before in the fictional county of Barsetshire. Many threads that were opened in the series, as well as the fate of multiple characters, are resolved here. What is more or less the main plotline involves Reverend Josiah Crawley, whom we met in some of the earlier books. A strict and at times harsh man, Crawley is extremely complex. When he is accused of stealing a small amount of money, he is threatened with jail and with the loss of his dignity and of his religious procurements. Making matters worse is that Crawley is often in a state of mental fog, causing everyone, including himself and the reader, to wonder if the clergyman actually did appropriate the money in a moment of incoherence. His predicament quickly becomes entwined with the ongoing ecclesiastical conflict that was begun in Barchester Towers. This conflict, between the diocese’s Bishop Proudie and his allies and Archdeacon Grantly and his allies, is still going on years after it began in the earlier novel. This struggle is acrimonious, but it is also at times portrayed with a lot of humor. A major subplot involves Major Grantly, the Archdeacon’s son, who is wooing of Grace Crawley, the Reverend’s daughter. This potential union is opposed by Archdeacon Grantly. Another important subplot concerns the now very self-confident and successful Johnny Eames, who is still pining for Lily Bart. Lily, for her part, still seems to be in love with Adolphus Crosbie, who jilted her years earlier. This aborted engagement was a major component of the plot of The Small House at Allington. As I alluded to above, there are numerous additional subplots and characters contained in this voluminous novel. This book is so long and involves so many characters and situations that it is difficult to write about it in a concise way. As is typical of Trollope, it is filled with complex and dynamic characters and interesting plot developments, as well as creative and lively writing. Other than the aesthetic and emotional payoff of reading about the marvelous characters previously introduced in the series one last time, this book really shines with Trollope’s superb depiction of Crawley. Introduced earlier in the series, the clergyman here is depicted as an extremely multifaceted and enormously flawed character that, nevertheless, is not lacking in virtues. On the outside, Crawley is a strict and puritanical religious figure. Rhetorically intimidating, he endures great hardship for his beliefs. Unfortunately, he also allows his wife and children to suffer as a result of his refusal to accept charity from others. He also takes some questionable stances based upon his unbending, and at times illogical, principle. Though a strict and sincere Christian, on the inside the Reverend is self-pitying, prideful and resentful of the success of others. Yet, Crawley is no monster. He has a conscience despite his stubbornness, and he sometimes compromises his principles to alleviate the suffering of his wife and children. He is shown to minister and provide assistance to the worst elements of society that no one else will have anything to do with. He firmly stands up to some pernicious people who seem to get away with bullying and intimidating everyone else. Despite some ill advised and irrational stands on principle, he is an ethical man who often refuses to waver from a moral path. Crawly is shown alternately to be mean, kind, stubborn and hypocritical as well as noble. Trollope’s portrait of him ranges from tragic to the downright hilarious. Ultimately, he is a brilliant literary creation. And yet he would take the bishop in his grasp and crush him,—crush him,—crush him! As he thought of this he walked quickly through the mud, and put out his long arm and his great hand, far before him out into the air, and, there and then, he crushed the bishop in his imagination. Yes, indeed! He thought it very doubtful whether the bishop would ever send for him a second time. Then he stalked on, clutching and crushing in his hand the bishop, and the bishop's wife, and the whole diocese,—and all the Church of England. The ensuring confrontation indeed sees Crawley verbally “crushing” the pair, in a hilarious manor. There is so much more to this novel. Since it involves so many subplots and characters, as a stand-alone work, it can seem a little unfocused. Furthermore, it picks up so many threads from previous books. As such, I would recommend that this one be read only after completing all of the other series’ entries. When read at the end, it offers an enormously entertaining and satisfying wrap for the magnificent Chronicles of Barsetshire. My commentary on Trollope’s unusual Point of View is here.